Enjoy a cigar by all means - but make certain you've done the work first. Hockey hasn't - as this column for the Canberra Times made clear . . .
Tony Abbott will probably receive a brief polling bounce after his return from Europe. Yet his playing consular cop hasn’t advanced our national interest one iota and he’ll soon return to issues that can’t be sorted out with a brief photo-op and anodyne questions. The real problem Abbott faces is the person he’s left behind to sort out the biggest issue he faces: passing the budget. Tomorrow it will be three months since Joe Hockey strode purposefully into a room packed full of expectant journalists to unveil his budget. Since then he’s alternated between bombast – warning everyone to take their medicine – cajoling – encouraging us that if we have our medicine things will get better – and simply relaxing – wandering off overseas and not worrying about who’s taking their medicine. About the only thing he hasn’t done is anything to ensure his budget will actually pass the Senate. The last time a government was this incompetent at guiding its financial measures through parliament was 1975; that didn’t end well. Nearly 90 days post-release and the country still doesn’t have a budget. “Sloppy Joe” is living up to his nickname. At some point the shuffling will have to stop. Or perhaps not. Maybe Hockey has given up. Perhaps it’s all a bit too hard. His attitude seems to be that he’s decided the dose and, eventually, everyone will have to swallow their medicine, like it or not. 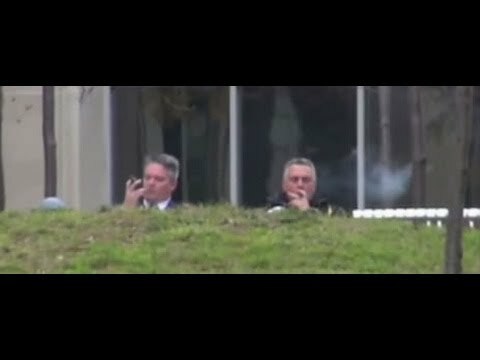 If so it seems the Treasurer hasn’t being paying attention. The wild card is represented by one person: Clive Palmer. Nothing can pass unless this big man waves it through yet there’s absolutely no reason for him to play ball. His three senators scraped in on a nationwide vote of 4.91 percent. Palmer’s political interests will be best served if the deadlock continues and a sense of chaos envelops the government. He can (justifiably) then claim the only way to resolve the impasse is for an immediate double-dissolution election. After all, that’s exactly what Malcolm Fraser did in 1975. Refuse to pass supply; create a crisis; and demand the people decide. What could be fairer? Tony Abbott’s finally met his match - an obstructive populariser out to win at all costs. An ‘all-in’ political poker player who has no problem ‘seeing’ Abbott’s right wing credentials and ‘raising’ him in the man of the people stakes. A double-dissolution brought on in an atmosphere of crisis would see Palmer’s party swiftly double its representation in the Senate because the quota for a seat would be halved. Hell, he’d probably win seats in the House as well, taking from the Nats. He has nothing to loose and everything to gain. That’s why Palmer won’t wave this budget, or any other one crafted by this government, through. Hockey’s handed his head to Palmer on a platter. He never was good at maths; he couldn’t even do his own numbers in the party-room battle to beat Malcolm Turnbull. He was an extraordinary choice for this current job, but it seems it’s not just his own numbers that confuse him. Apparently he was unaware the government didn’t have the Senate majority it needs to pass the budget. He also seems blithely unaware that his intransigence plays directly into his enemy’s hands. It’s less than a year since the electorate dispatched a government because it became more concerned about itself than the way the country should be run. Yet surrounded by the trappings of office and an effective, functioning department, even Wayne Swan managed to survive as Treasurer (while leading government spending over a cliff and splurging incoherently; sending cheques out in the mail and building things, needed or not). You may have thought nobody could be as childish again. You would be wrong. The world must look pretty good from the balcony off your office, particularly when you’re puffing on a cigar in the middle of the afternoon and telling the little people they need to pull their finger out and get cracking. Even I could manage that. But negotiating, compromising, and dealing in order to get policy through: well, that requires a professional. It needs someone who’s prepared to work, has a bit of nous, and who’s prepared to devote their attention to detail. Those are three qualities that Hockey’s desperately lacking. He’s out of his depth. Hockey either doesn’t see what’s required or he’s incapable of taking the first step towards resolving the problem he’s created. He goes about threatening dire consequences unless the budget’s passed and warning he’ll push for the adoption of even more draconian measures, but by doing so he’s simply revealing his own inability to craft a budget that can pass and incompetence at negotiating it through. The punters won’t be happy if he begins slugging us with extra taxes yet Hockey appears utterly incapable of recognising political reality, even when its mugging him. Last week in Canberra, Hockey insisted there’s been a “weakening of public commentary . . . abandoning the argument for good reform”. No Treasurer, you are the government. If you believe in the urgent need for greater inequality to boost productivity then it’s up to you to argue the cause for change. Thus far no convincing case has been mounted. Just ask that eager barometer of electoral opinion, Palmer. He’s been listening to the voters. If they were endorsing Hockey he’d lock-in behind the treasurer. But the electorate doesn’t like being told greater inequality is the answer. And if it is the solution, then they don’t like the question.